I’m not going to lie, trainee survival shows are quite fun to watch. I know they’re cruel but I personally think that it’s a great way to start a fanbase. I was really excited to see what Starship Entertainment’s trainees and television show had to offer. Just seeing the teasers alone really hyped me up, maybe a little too much. No Mercy started pretty roughly for me and unfortunately continued to be that way. 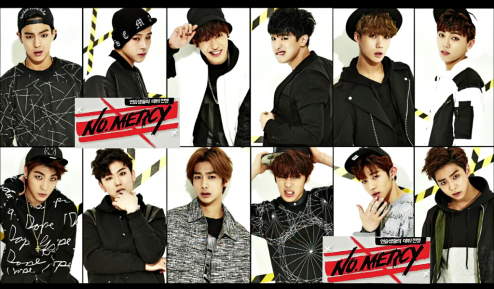 Read on to find out 5 reasons why I stopped watching No Mercy. 1. I didn’t like the ranking system. I felt that this was super unfair, not only for the trainees but also for the audience. When you pre-rank people that way people will automatically think that this is the standard. I personally don’t like it when someone sets a standard for me, especially in k-pop. I know what I like and I would rather you not tell me right off the bat who’s good and who’s not. Let me judge them for myself. Though, it does create a good underdog story but I’m pretty sure the series didn’t have an underdog story. 2. I didn’t understand how the final group was going to be made. Was the final group going to be determined by the audience or by the company? I wasn’t sure how the whole elimination thing worked or how the group was going to be finalized. I thought they had groups already made, so then I thought “oh so they’re doing a WIN kind of thing” (I was not one of those haters who thought that them ripping of the WIN was the worst thing in the world) but then it turned out to be an individual thing. Then they did a whole thing on rappers vs. singers, which was completely unfair because there were only 4 rappers. They focused on that aspect a lot but it didn’t really matter much. In the end, I was just really confused. To this day, I’m still not sure how the final lineup was made. 3. The first group/team mission was AWFUL. In my opinion, when an entertainment company decides to do this kind of show, it should really try to highlight people’s best aspects instead of trying to make them crash and burn. The people they paired up together, clearly, were just not meant to be together and that they did it on purpose made me really angry (not just for the sake of improvement, it is television we’re talking about here). Not all of them but some of them. I will admit though, I didn’t watch all the performances in this round as I lost interest in the series after a few performances. 4. They played favorites so hard. *cough* Shownu *cough*. They made it so obvious who they favored the most out of everyone. So obvious. I mean show some love to the other trainees too. 5. Deokspatch kind of ruined it for me. Deokspatch is the behind the scenes videos that they made for the show where they basically just played games. Just after a few episodes in they totally spoiled who got eliminated (before the episode even aired) by not featuring them on the episode, while everyone else was on it. Like, why? I’m so sad that I didn’t have the motivation to finish it. I was so pumped and ready for another great trainee survival show. So pumped. Overall, it was just really confusing. I didn’t really understand the concept, and I felt that they didn’t explain it well at all. It’s a shame because I really like this song with Mad Clown, Joo Young, and Giri Boy ft. No Mercy Trainees. It’s so good. Why couldn’t the show be like the song? I know this was a pretty negative post. I’m not hating on Monsta X, I’m actually really excited for them. I just wish the show was a lot better. Let me know what you guys thought about the show. Why did you stick with it? Or if you didn’t, why did you quit? Quiz Time: Who will I collaborate with?